Going on to the next day after visiting some places in Port Blair, we start for our trip towards North and Middle Andaman. The Great Andaman Trank Road (ATR) , which is NH 223 will take us there. We start by 4 AM sharp and drive to the Jirkatang check post, which takes a little more than an hour from Port Blair by Car. This is the starting point for the tribal reserve. We have some breakfast in the road side shops with piping hot idly, sambhar, vada along with a fresh chutney and a steaming cup of Chai tea. We notice the convoy timings and the government directive for using the great Andaman Trank Road to travel to the other parts of Andaman. There is an interesting thing about ATR, it is ivided by creeks at places and connection to the other side is possible through barge. Also, the road from Jirkatang to middle straight is part of the tribal reserve, inhibited by the Jarawa, one of the five indigenous people of the Andaman Islands. Jarawas were hostile towards out siders until recent years. The Andaman Trunk Road, faced some severe hostilities from them including killings of personnel working on the road construction. The situation has changed in recent years. The govt. now maintains a no contact policy with the Jarawas. The road also is not always open to public, in fact there are specific timings for the vehicles to pass through this forest area. The vehicles are moved in convoys. Interactions with the Jarawas in ANY form, including stopping the vehicle, giving them food, taking their pictures etc. are completely prohibited and punishable by law. I moved with the convoy at 9 AM, the first convoy, and for entire time till middle straight , I was not able to see a single Jarawa. And to be frank…I was happy, even relieved not to have turned out to be just another inquisitive tourist. My mom, however, was able to see an individual, she said, she saw a bright black man sitting on a rock like he belonged to the jungle, and the jungle belonged to him. How true! Love you mom 🙂 Instead, I saw huge canopies of tall, ancient trees, bright green leafs making the black patch of well maintained road look greenish in the morning light coming from the top, occasional sighting of one odd unknown bird..too bad I could not take pictures of them, All I wished was for these proud, beautiful individuals was luck. Next Post Andaman Dreams – travel continued! 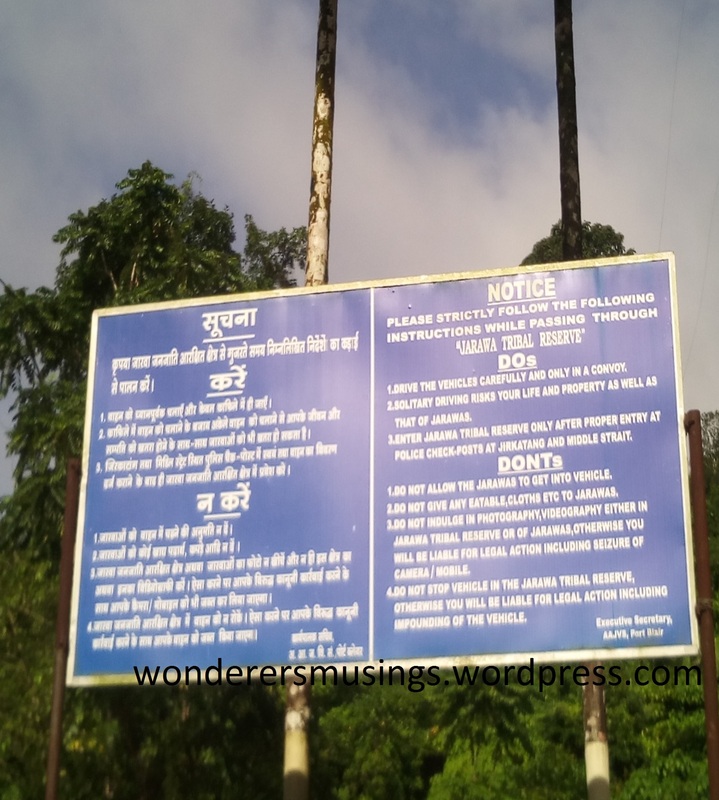 Pingback: Andaman Dreams – Port Blair | Wander watch..